Special thank you to Harper Books for this amazing opportunity. This is one of the most powerful stories I have ever read. I’m speechless, but I need to find a way to tell you all why this book is so important to read. I cannot get over or fathom the tremendous strength of Palestinian women coping and persevering through the most horrific treatment: having your soul, dreams, and body crushed on a daily basis, but finding a way to survive. It’s emotional, painful, and important to learn the stories of these women. Isra is unable to finish school in Palestine because her parents arranged for her to be married to Adam Ra’ad. Adam is a deli owner in America so Isra is sent to New York to live with him and his parents, Fareeda and Khaled. The home is crowded with the in-laws, the newly married couple, and their four daughters (who were all born within five years of each other). Isra thinks maybe she’ll be treated differently in America but the oppressive tradition of Palestinian life is enforced: Isra is solely meant to cook, clean, bare children (specifically a son), and always remain silent. Soon after they are married, the verbal and physical abuse starts, and to add salt to the wound, her mother-in-law, Fareeda, sees Isra the same as the men see her – without value. Suddenly, Adam and Isra are killed in a car accident leaving their four daughters in the care of Fareeda and Khaled. Now the caregiver for her grandchildren, Fareeda continues to push the oppressive traditions, even though she has lived in America for decades. Deya, the eldest daughter, is now eighteen and misses her mother tremendously. Deya is an amazing force as she’s educated, an avid reader, dreamer, and everything she’s not supposed to be by her grandmother’s standards. But then something mysterious happens and I encourage you to read this book to find out what. Right up until the very end of this debut I was in a trance. I could not stop reading it because I had to know the outcome of these women’s lives. 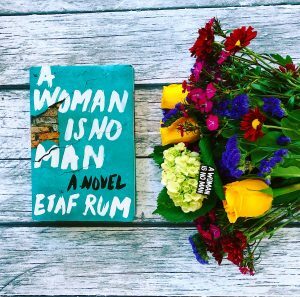 Etaf Rum is an extraordinary writer and you can tell by reading her book that it is very personal. I mean, I cried…and I never cry. The ending finally made the tears happen and I just had to go with it. 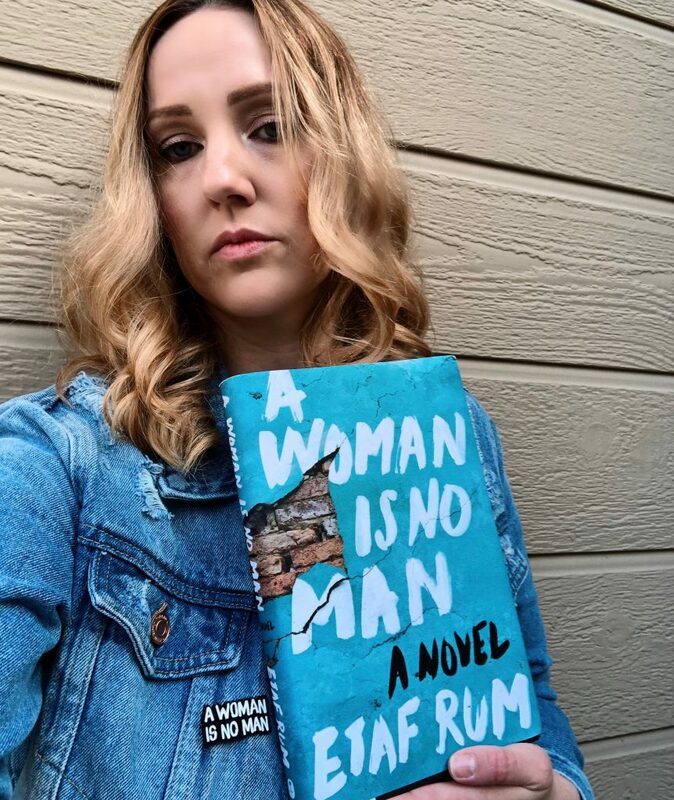 Also, I just have to mention that Etaf is a kind and lovely person from what little I know of her, and I’m continually in amazement of her and of her remarkable novel, A WOMAN IS NO MAN. I rate this book 5 out of 5 stars! Click here to read Etaf Rum on LitHub. Click here for Etaf Rum’s interview on NPR.